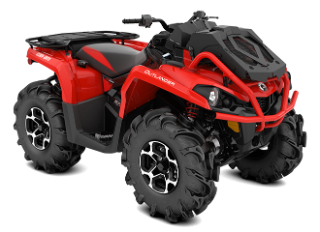 Equipped with the 48-hp Rotax 570 liquid-cooled V-Twin engine, with four valves per cylinder and single overhead camshaft, this Can-Am engine gives you the power to get in and out of the toughest mud holes. The 28-in (71 cm) ITP Mega Mayhem∞ 6-ply tires offer exceptional mud characteristics. Large lugs and an aggressive tread pattern are designed to give maximum traction in the mud and a smooth ride on hard pack surfaces. The 12-in (30.5 cm) cast-aluminum wheels reduce unsprung weight and offer improved strength. The front bumper is factory installed and are covered by a factory warranty. The added protection gives peace of mind in rugged conditions.